I landed safely in Melb last Thurs – but was taken aback by the weather. 3c when we landed………Melb’s coldest Aug day for 50 years, they said! Since then I have been organising my life back in St K & trying to adjust to jet-lag. This means my usual daily 1 hour walk – but I am tired by 3 pm & no matter when I go to bed I wake at 12 midnight. Yesterday I went to the footy at the MCG & today will watch the big Port Adelaide game with my PAFC friends at our pub. Then follows a week of the usual appointments & catching up with friends. I have been back 2 weeks now & life is back to normal. That means I went to Adelaide for the footy last weekend. Great to catch up with various friends before the game & to have lunch with my cousins on the Saty. Meanwhile in St Kilda the weather continues to be a mix of winter & early Spring. Most days I go to Mass at All SS & have lunch or dinner with friends, either at my home or their place………& try to find time for reading. This Saturday I catch the train to Ballarat to see Port Adelaide play Western Bulldogs. This is the 1st AFL game in Ballarat & I have a seat in the stands from the club. Hopefully it will not be a typical Ballarat day – cold & wet! On Friday I entertained Bp Lindsay & his former assistant at Walsingham, Fr Stephen, with his wife, for lunch. They are in Australia for a 3 week holiday – their first visit here. We were a great team when I used to assist at the Shrine every October. Lots of reminiscing about Walsingham. In the evening I went for dinner with my friends, Dale & Ian. This is the couple who loaned me their apartment in the city when I visited Melb during my time in SD. It was Dale’s b/day & 7 of us started with champagne at their home & then went to a nearby restaurant. Next morning I was off to Ballarat for the footy. At the station I was met by an old friend, Andrea, who shares my b/day. We had brunch at the Ballarat gallery, then she drove me to the stadium. I had an excellent seat amongst Port Adelaide members in row 2 of one of the new stands. There were a lot of Port supporters at the game & we witnessed (eventually) a gr8 victory for Port! This morning I went to Mass at CC Brunswick & it was nice to be officially welcomed back. On Thursday I went to the airport to meet Clare Jacob. 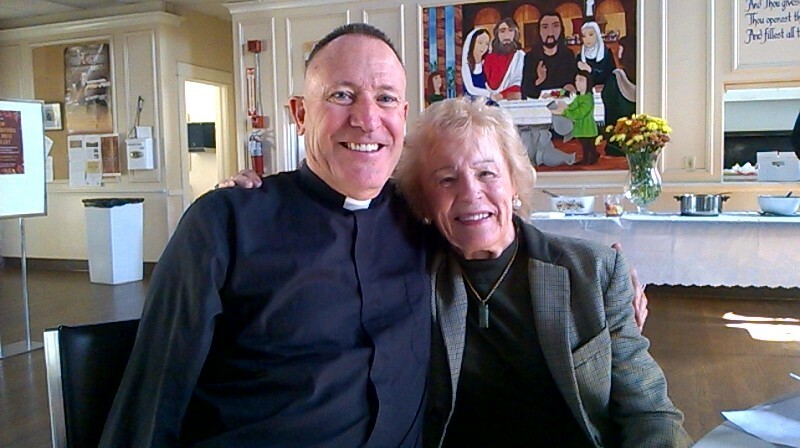 Clare was my Warden in SD & a great friend. She is having a month travelling around Australia, based in Melb. We had lots to catch up on, after which I gave her a tour of St K. I was going to Adelaide for the w/e, so organised accomodation for her, as well as being taken to the footy on Saturday & St Mark’s, Firzroy on Sunday. 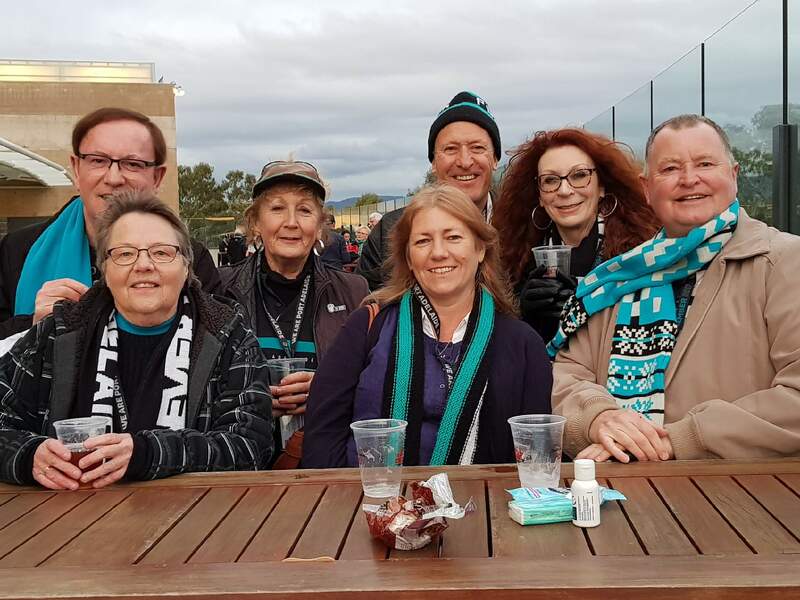 Yesterday was the last home game for Port Adelaide & I caught up with my usual friends. Port won well……now for the play-offs! Big news this week was the resignation of my successor as Rector of All Saints’, Fr McQueen. This was quite unexpected. He gave just a week’s notice, so the parish must be in shock. I am sorry I am not there as an old friend & their former pastor to boost their morale. Ironically, I will be back in SD in exactly 1 month – so I can give personal encouragement to them. Today I fly to Perth & then to Broome for a few days. Last year the AFL introduced a bye w/e before the Finals. With no footy, I flew to Perth & on to Kalgoorlie for a few days. I enjoyed discovering a famous town on my travel list & resolved that in future the AFL bye w/e would be an opportunity for me to travel to WA & discover places I had not visited. 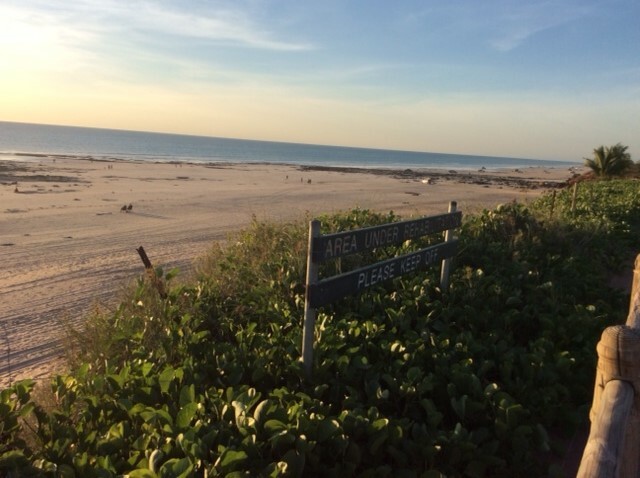 So this year I am going to discover Broome. 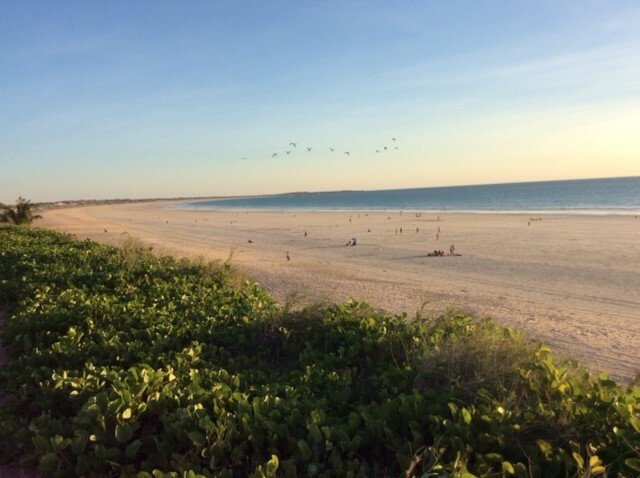 My 2 days in Broome were very relaxing, with 35c weather. 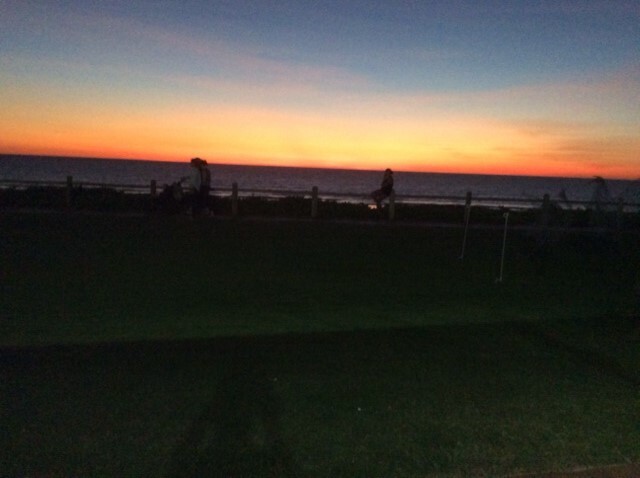 Dining whilst the sun set at Cable Beach was a highlight. I returned to Melbourne on Thursday & on Friday attended the stunning AFL Final at the MCG with 95,000 people, mainly Richmond fans. It was an amazing atmosphere as the Tigers massacred Geelong. Clare Jacob returned to Melbourne yesterday – she is my guest for dinner tonight with Bp Lindsay, whom she met at Walsingham when he was Administrator. Tomorrow we will go to the 10.30 am Mass at All SS & in the evening I have another dinner party with Clare & Fr Rene, the priest at All SS. On Monday I flew to Sydney fro the annual SSC Synod. This was an excellent 4 days of fellowship, worship & talk. The highlight was having Bishop John Ford of The Murray diocese (our Visitor) with us. It was good to catch up with old friends & participate in the Masses & Offices. Today I am off to All SS for the monthly Walsingham Mass & cell meeting. In the afternoon I go to the MCG for the big AFL Preliminary Final. They expect 98,000 there – most of them mad Richmond fans. It should be quite an atmosphere! Grand Final day & I am off to the game, of course! Richmond won last Saty & now face the Adelaide Crows. It is impossible not to get on the Richmond bandwagon…..esp as they play the arch-enemy! Melbourne comes alive in Grand Final week & I have been busy. Clare returned to Melb on Wednesday & in the evening I took her out for a farewell dinner on the Colonial Tramcar Restaurant. She flew back to the US yesterday. I fly back to SD on Tuesday. After a brief stopover I go to London & then onto Walsingham. Since I retired I have been spending 3-4 weeks every Oct assisting at the shrine. With a new administrator now in place I have decided not to continue assisting as a member of the staff. I have enjoyed it, but now it is time to go there for shorter visits as a pilgrim. After a busy 3 days in SD I am now on my way to London. The weather here has been beautiful. As well as visiting friends/parishioners I also met with my agents to discuss selling my condo. On Thursday I met with the Parish Secretary to prepare for All SS patronal festival on Nov 5 & also for a Requiem Mass yesterday. I was pleased to be in SD this week to celebrate the Requiem for a woman I knew. She was the mother of 2 of my All SS friends & I would enjoy meals with them all when I as Rector, as well as on my SD visits in recent years. Now I head to the UK for 4 weeks, with Walsingham my destination. I arrived in London last Sunday & for the 1st night stayed in a nice hotel with a view of St Paul’s. This was a new hotel to me – I used points for a free night, as I do when I have arrived from an international flight. In the evening I went to St Mary’s, Bourne St, for Evensong & Benediction followed by Mass. I met the new Vicar & told him of my long connection with St Mary’s. On Monday I wandered around the city, enjoying familiar sights. In the a/noon I walked over the Thames to the Bankside Hilton, which has become my London home. Tuesday I did a load of washing at the local laundromat. One of the essentials with travel is to know where the laundromat nearest my hotel is. At 1 pm I had lunch with 2 SSC priests from north London. It was great to catch up, but I talked too much! On Wed I caught the train to Edinburgh. 5 hours thru nice scenery & eventually along the North Sea. I had not been to Edinburgh before (suprisingly) & my hotel was just on the Royal Mile. Upon arrival I explored the Royal Mile & St Giles Kirk – which I found boring. On Thursday I visited Holyrood House & the castle. The Scottish crown jewels were the highlight. On Friday I caught an early train back to London & was welcomed back to the Bankside by the staff. At 4 pm I walked to Westminster Abbey to attend Solemn Mass for the Feast of St Edward the Confessor. The music was excellent……..the Abbey choir must be the best Anglican choir in the world (as it should be). Today I will return to the Abbey for their National Pilgrimage, culminating with Evensong & Procession. 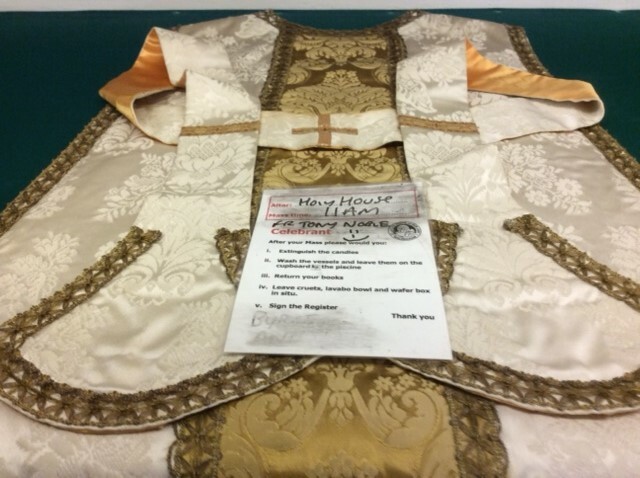 Tomorrow I will attend High Mass at St Magnus the Martyr. On Monday I catch the train to Walsingham. The rest of Tuesday I visited the shrine shop, the sisters & friends in the village. In the evening I assisted at the Healing Service, as usual. On Wednesday morning I concelebrated the weekday Pilgrim Mass. In the evening I carried the statue thru the grounds with another priest, as there were no people to do it. This was another Walsingham first for me. Thursday I said Mass for the Sisters, followed by Exposition & Benediction. I had not used the Priory tabernacle before, so was not sure how to actually open it – but a word from the Server solved that problem! On Friday I prepared my sermon for Sunday at St Mary’s. Having preached there twice in recent years, I am looking forward to it again. The gospel is well known (Render to Ceasar) but I can’t remember if I have ever preached on it. Friday night I went out for dinner at the local pub with Fr Kevin, the new administrator, & my good friends, Stephen & Jo. We had a great night with lots of laughter. I look forward to the w/e & return to London on Monday. 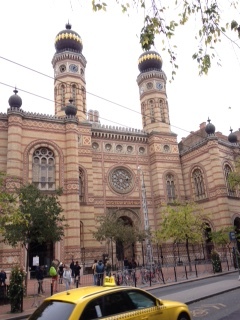 After returning to London I flew to Berlin on Wed & then to Budapest on Thurs. 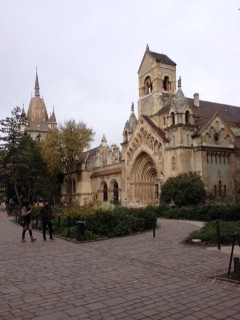 I first visited Budapest in March 1991, on my way to Transylvania, & returned again in 2012. 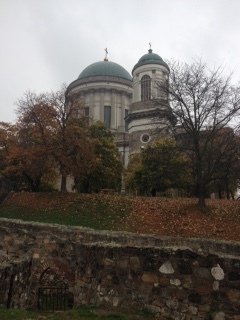 I have seen all the tourist sites & my purpose this time was to visit Esztergom, which is the royal & religious heart of Hungary. 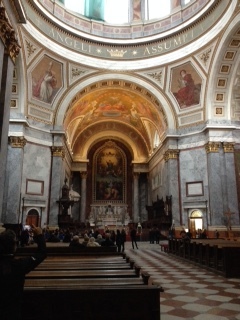 After checking into my hotel I walked to St Stephen’s basilica & familiarised myself with Budapest. On Friday I caught the train to Esztergom, which took just over an hour. The train was a nice modern one (probably made in Germany) but the stations were in various states of repair. Esztergom reminded me of Romania, with terrible roads & sidewalks, ugly communist housing & 1930’s art-deco homes in need of renovation. But towering over the town is the huge basilica. 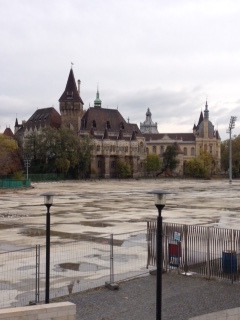 On this site the 1st Hungarian king, Stephen, was crowned. The original basilica was part of the royal compound & was sacked by the Turks in their invasions. The current one was built in 1856. 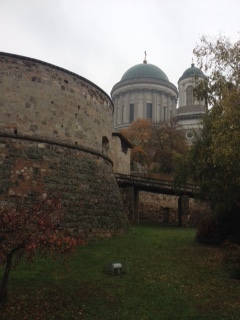 Next to the basilica is the Royal Palace museum, built on the foundations of the palace. 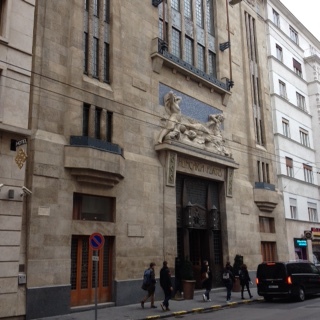 I enjoyed exploring both, then caught the train back to Budapest. 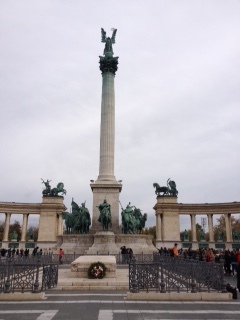 Today I walked around Budapest for 4 hours – actually Pest, Buda being on the other side of the Danube. 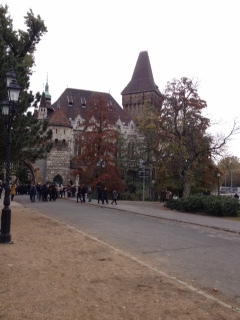 I started at City Park, where in 1896 was built Vajdahunyad Castle. 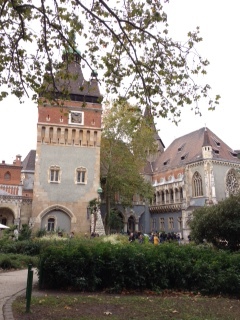 This is an architectutal mix of Transylvanian castles & fascinated me on my previous visits. Walking around the city I enjoyed observing the architecture, as I always do when visiting cities, particularly in former communist countries. 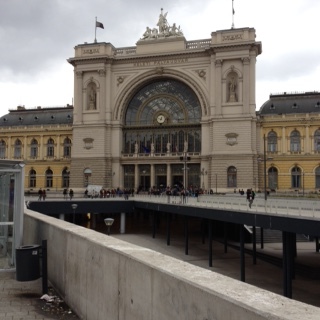 I passed Keleti station, 1 of the 2 in Pest serving Eastern Europe. Across the river in Buda is the station serving the West. I vividly remember arriving at Keleti from Transylvania in March 1991 & having just 15 mins to get to the Buda station to catch the train to Munich. I hailed a cab, stressing my urgency, & made it with 3 mins to spare. Having no Hungarian currency, I offered him a few US $$$, which he happily accepted. I had a Eurail pass & was delighted to find a spare seat in 1st class. Never had ordering a drink been so welcome! Tomorrow I will attend Sunday morning Mass in St Stephen’s basilica & in the a/noon explore Margaret Island in the centre of the Danube. On Monday I fly to Munich & on Tuesday to London. After 2 days there I return to SD. After 2 days in London, incl attending a beautiful All Saints’ Day Mass in St Alban’s, Holborn, I flew back to SD on Thursday. Was very tired, of course – have been waking at 2 am & wanting to sleep at 5 pm! 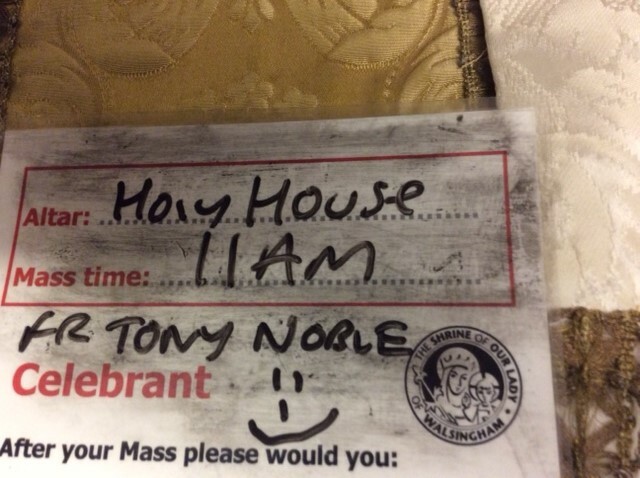 Friday was a busy day, incl going to the parish office to organise Sunday’s Services, which I am taking. Saturday I said Mass for the Society of Mary, followed by lunch. I started this group soon after I came to All SS & took 10 of them to Walsingham in 2007. It was lovely to say their monthly Mass & see them again. Yesterday was the Patronal Festival & the 2 Masses were wonderful. There are less people involved & assisting now, but the choir at the Solemn Mass was excellent. I enjoyed being back & preached a challenging sermon. The attendances were the best in several years – tho not what they were in my time. How to rebuild & grow the parish is a crucial question for the parish & its new Rector. My sermon has been posted here under Recent Sermons. Today I go to Newark for a few days, a city I have never visited. I return to SD to celebrate a wedding on Saturday. Then it will be time to return to Melbourne!